The "Flying Tiger Line" was formed in June of 1945 by a group of former C-46 'Hump' flyers with General Claire Chennault's 'Flying Tigers' in China during WW2. Originally the "National Skyway Freight Corporation" and renamed in 1946, the airline concentrated exclusively on freight operations, military charters, and as a scheduled U.S. transcontinental service in the late 1940s. In 1969, the scheduled routes were amplified by service across the Pacific. Insignia of the original "Flying Tigers" of World War II. In June 1938, Lockheed began design work on an airliner to satisfy a Transcontinental Western & Air (later Trans-World Airlines - TWA), requirement for a non-stop transcontinental airliner with a 3,500-mile range and 6,000 lb. payload capability. Construction of a prototype began in 1940, however, the U.S. was soon involved in the Second World War and all production was directed to military needs. As a result the prototype was first flew on January 9, 1943, as a military aircraft. First known by its civil designator as Model 049, it soon became better known during wartime by its military designation, the C-69 Constellation. 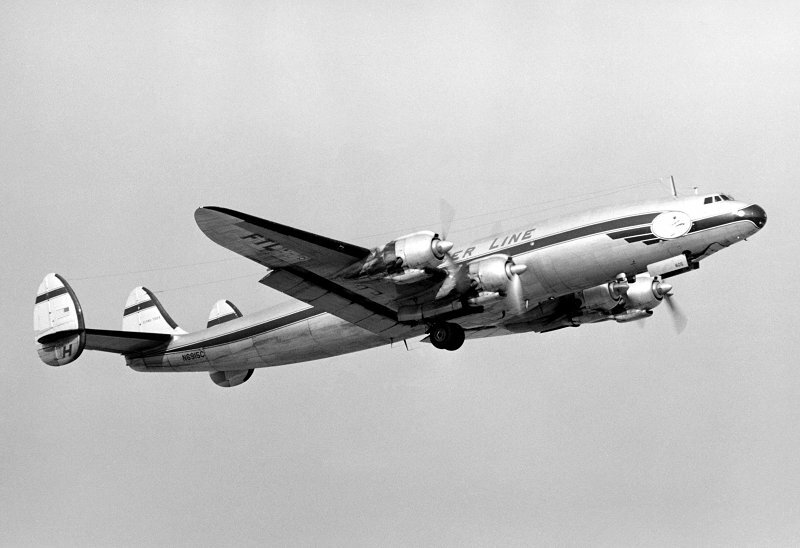 Improvements were steadily made, beginning with the L-649, which was the first Constellation built as a commercial type and the L-749 which was the long-range version of the 649. After the war the Connie emerged as one of the premiere passenger aircraft of the world. However, by the late 1950's, jets were what the public, and airlines, wanted so the Connie was demoted to the role of passenger liner in the Third World countries and cargo carrier. The Lockheed Super H Constellation, (converted as a cargo carrier) able to carry up to 43,000 pounds of cargo, and traveled at 300 miles per hour over a range of up to 2,500 miles. 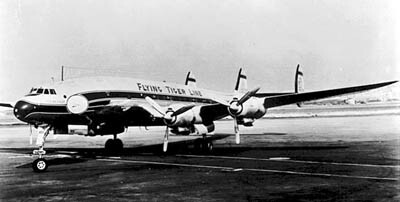 The "Super Connie" helped Flying Tigers revolutionize the sales map of the United States with the first nonstop, transcontinental airfreight scheduled routes. On Wednesday, December 23rd, 1964, a Flying Tiger Line Constellation, N6915C, arrived at San Francisco International Airport from Japan. Filled with a cargo of electronic equipment, bolts of fabric, women's scarves, bandanas, purses, and costume jewelry for the Christmas holiday, she refueled at San Francisco Airport (SFO) and departed just after midnight with her crew of three, 41,000 pounds of cargo, 136 pounds of mail, and 5,000 gallons of high octane aviation fuel. The weather was that of heavy fog and rain. A large cold frontal system was moving onshore, and on the north coast of California, heavy flooding was destroying homes at a wholesale pace. Already a Coast Guard helicopter had been lost in these conditions. Leaving from Runway 28, going northwest from the bay, flight 282 was head out over the ocean to circle and gain altitude then travel east towards to her final destination of New York. However, shortly after takeoff, the plane veered to the right of it's planned course. The pilot, Jabez A. Richards, 49, of Bayhead, NJ, asked the tower for permission to change his radio frequency from takeoff to departure frequency. With him were Daniel W. Hennessy, 33, of Hillsborough, Calif., as co-pilot, and Paul M. Entz,37, of North Hollywood, Calif., as flight engineer. Seconds later, the plane vanished from the tower's radar scope. Nearby, at the San Francisco City Jail #2, Lieutenant Paul Anderson, the watch officer at the time, witnessed the tragic event, "The plane's four engines were throbbing at full power - but sounded normal- except that they were too low." "The building shook because it was right down on top of us, maybe up about 100 feet. The motors were going along and then there was suddenly a big ball of flame." 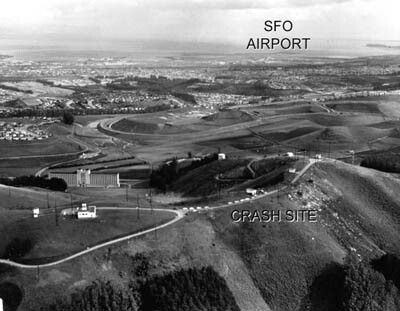 An aerial view of the Coast Guard radio station and the crash site. 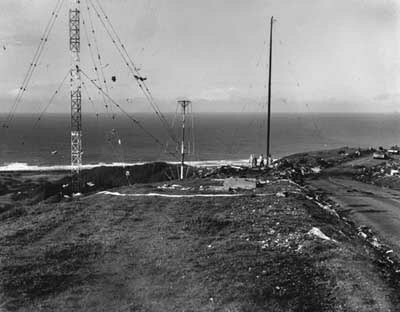 Fred Goodwin, a Coast Guard Radioman Second Class, at Coast Guard Radio Station San Bruno, remembers, "It hit just about 50-75 feet below transmitter Building 1. The main receiver building was about 100 yards northeast of transmitter Building 1. 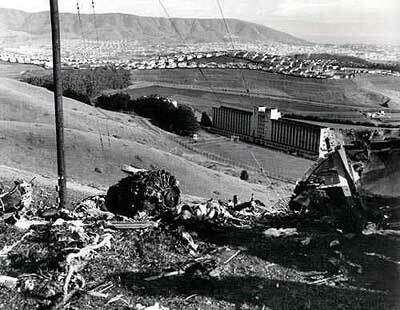 The main window in the receiver building looks outward to the north towards San Francisco (directly away from the crash site). When the plane hit the watch standers in the receiver building did not know what had happened but looking north through the window the entire sky was red. They, the watch standers, thought that the Soviets had dropped the big one." 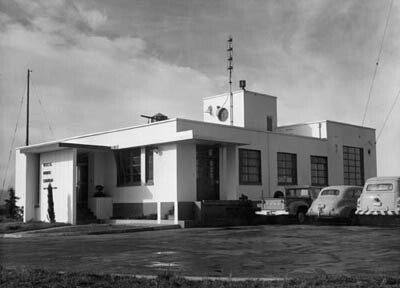 The Main Operations building at USCG RADSTA San Bruno. "I was in the barracks on the phone to my wife. I had just gotten off watch at 11:45pm. We, my wife and I, lived just over the hill (Sweeney Ridge) in Pacifica. When the ‘Connie’ went over I asked her if she heard it. She said 'no'. At that moment it hit. I was the senior man since the Chief had one home. I gathered up the troops of my watch and we went up the 1/4 mile or so road to the top of the ridge. All we saw were flames at the crash site. We did not know, and assumed, it was a passenger aircraft. My troops were going 'nuts' because we couldn't get close enough to 'rescue or save' anyone or determine if anyone was still alive. I went into the receiver building and contacted our headquarters in San Francisco (Commander - Coast Guard 12th District) to inform them what had happened. I was in the receiver building for approximately 20-30 minutes. When I came out the hill was crowded with people, police and firefighters." Philip Ellia, also recalls, "At the time I was the senior Chief Radioman of operations with normal day work hours and was no longer one of the regular watch supervisor chiefs. That evening was typical San Francisco Bay December weather, fairly cold/damp with heavy fog over Pacifica (where I lived) west of the ridge. I had just gone to bed around midnight when my wife said she noticed a significant illumination of the fog cover but no unusual noise. Within a few minutes I received a phone call from the watch supervisor, Radioman Chief Kendrick, stating there was a big explosion, possibility a plane crash or that something happened in one of the transmitter buildings." "At the time, the operations building still had power but lost it little later. At approximately 950-feet above sea level, the station complex was enveloped in dense fog plus strong westerly winds. I was able to get there within 20 minutes along with many local police and fire cars and trucks. The ridge was littered with debris. (I heard a few days later they were picking up women’s scarves and white gloves well within the San Bruno city area.) was obvious that there would be no survivors. I had personally been concerned with grim thoughts of bodies all over the place if it had been a passenger plane. Later we learned that is was a cargo plane with a crew of only three. Bad as it was, it certainly could have been much worse. The fact that it came so close to a direct hit on the Country Jail and our Main Operations Building was pure luck." 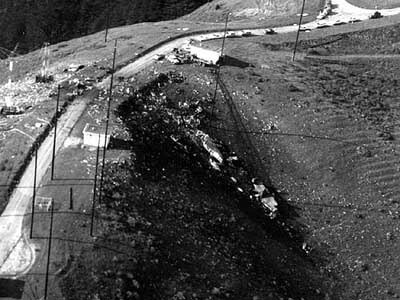 View of the radio transmitters after the crash. "Most of our transmitting capabilities were gone with the lost of the three transmitter buildings. We lost all power, including the emergency turbine generator transformers that had been damaged by crash impact and rendered useless. That along with lost of the individual transmitter building generators equaled "lights out" until we were able to fire up the Operations Building generator which supported that building only. But once we were able to get the building generator on line we were able to restore the Operations Building with limited capabilities." "The generator building housed a prototype turbine generator for anticipated installations at CG Loran Stations and after a test period was designated as the primary generator backup power source. At that point the small individual generators in the main operations building and the 3 transmitter buildings were for all practicable purposes ignored until their removal and no longer required their routine maintenance and monthly load operations. Station returned to normal operations in a fairly short time but stayed in business (with severe limits) throughout the event. Hectic time to say the least!" "The station had a great crew, men like Crigger, Huffman, Goodwin, Gaida and many others who all pulled together and went well past their usual duty responsibilities. " Looking down upon two of transmitter buildings narrowly missed by the wayward Connie. Looking at the impact site from the south. The plane had plunged halfway up the eastern side of Sweeny's Ridge, bounced back into the air, and struck about 75 feet down from the hill's crest. 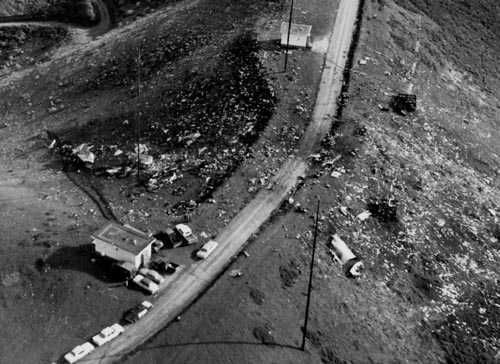 Debris from the plane was thrown over the rim onto the western side of the slope, and torn through a pair of Coast Guard radio transmitter antennae. The wreckage also knocked down a 5000-volt power line, which came dangerously close to contact with the fuselage of the aircraft. The only intact portion of the aircraft remaining was the rear section of the fuselage, and a portion of the tail. The wreckage was sprinkled with colored scarves and costume jewelry. The Coast Guardsmen were helpless to assist the victims of the crash, all three of which were killed instantly in the crash. The crash area was roped off and guarded closely by the Civil Aeronautics Board (CAB) and the sheriff's office pending the arrival of a CAB investigating team. Unlike commercial jet aircraft, this Connie carried no flight recorder, thus preserving a accurate portrait of the plane's final moments was impossible. Looking towards the jail from the ridge top. One of the Connie's engines is present in the foreground. The CAB, in their final report on the accident, determined the probable cause of the accident was that the pilot, for undetermined reasons, deviated from the departure course into area of rising terrain where downdraft activity and turbulence affected the climb capability of the aircraft sufficiently to prevent terrain clearance. Special thanks to members of USCG Radio Station San Bruno '64, Lieutenant Fred Godwin (USCG, retired), for his eyewitness account, and Commander Philip Ellia (USCG, retired), for his account of the event and photographs of the site.